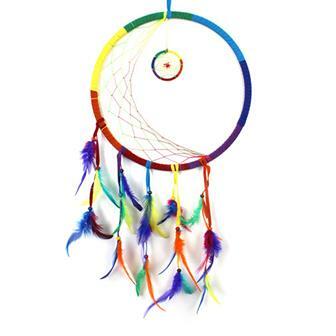 Dreamcatchers are used as a protective charm, especially for children. They are said to protect against nightmares, filtering bad dreams by capturing them in the web whilst allowing good dreams to slip through. 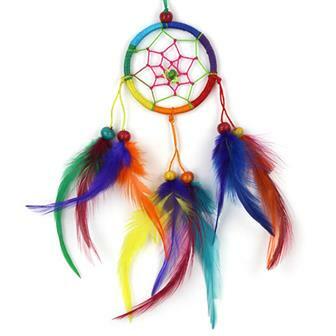 We stock a wide range including colourful creations and understated natural material dreamcatchers. 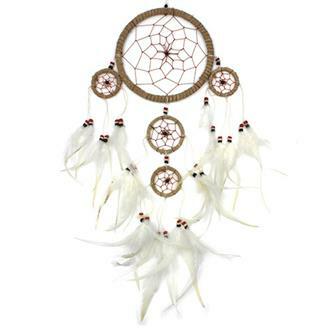 Small but elegant dreamcatcher made with a hoop of rattan woven with tan coloured web interspersed with semi precious stone beads and finished with lengths of faux suede, natural feathers and larger beads. 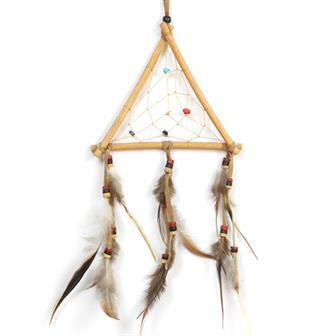 Triangle shaped dreamcatcher made with a simple yet elegant hoop constructed from rattan and secured with faux suede. 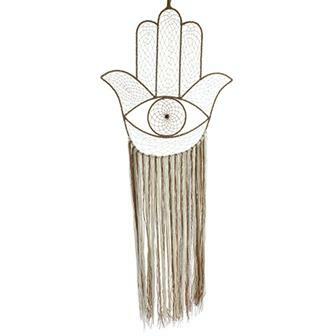 The shape of the frame creates an interesting central web which has been woven with a few semi precious stones. Finished with beads, feathers and faux suede. 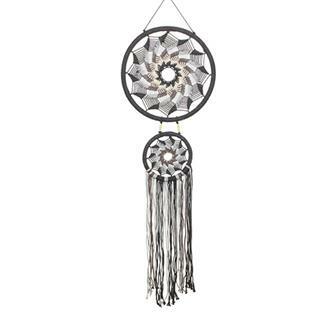 These smaller versions of our elegantly shaped tear dreamcatchers feature bold black feathers and a loop for hanging anywhere. 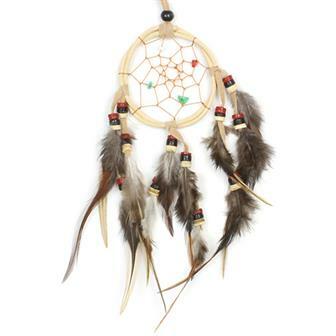 Dreamcatchers are believed to help provide protection, particularly for children, against bad dreams. 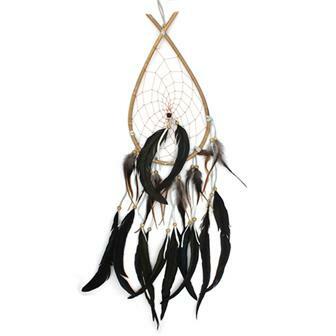 Elegantly minimalist, these tree design dreamcatchers are made by twisting and tying rope. 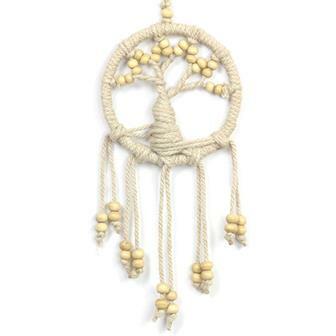 These vegan friendly dreamcatchers are finished with a multitude of wooden beads to form the branches and leaves in the tree. Bold and beautiful atypical dreamcatcher with an fantastic tree design 'web', the wire construction in decorated in a plethora of colourful wooden beads to form the leaves. The hoop is finished in rich black faux suede and large natural feathers. 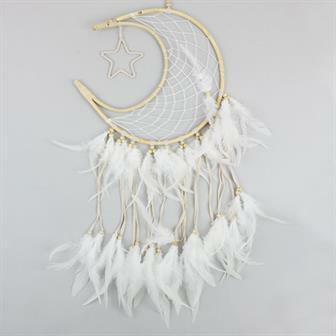 Large moon and star shaped dreamcatcher with the hoop formed from rattan and strung with white nylon, this elegant piece is adorned with light tan faux leather pieces, wooden beads and white feathers. 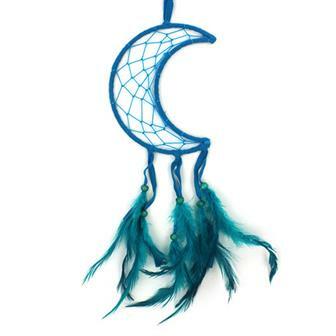 These small, crescent moon shaped dreamcatchers are made in bold colours using vibrant nylon and feathers. 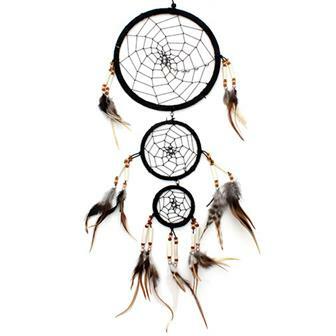 Dreamcatchers were used as a protective charm, especially for children, to protect against nightmares. 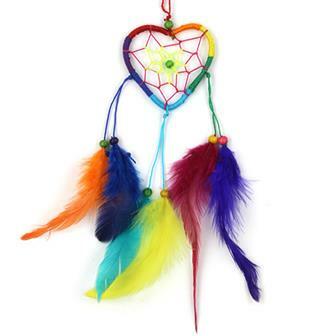 Miniature, heart shaped dreamcatcher made in bright rainbow colours using vibrant nylon and super bright feathers. 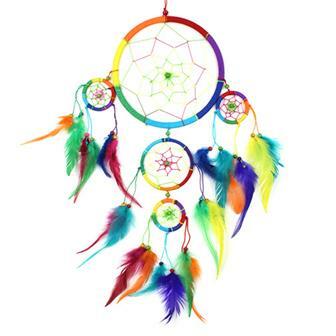 Dream catchers were used as a protective charm, especially for children, to protect against nightmares. 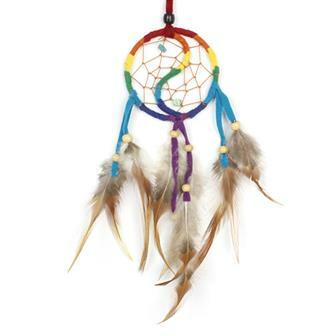 Bright and cheery rainbow faux suede covered dreamcatcher, where the hoop has been shaped to form a Yin Yang design. 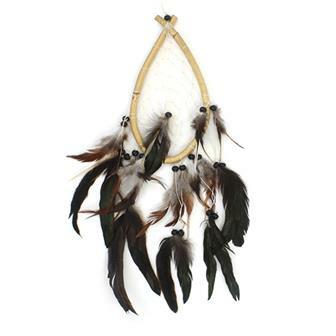 The web has been woven to include small semi precious stone beads and is finished with wooden beads and feathers. 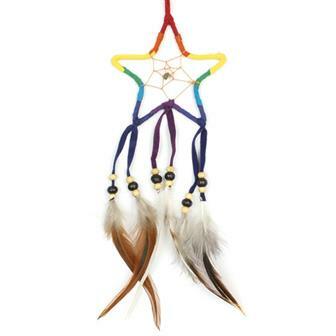 Funky star shaped dreamcatcher covered in vibrant rainbow faux suede, finished with wooden beads and natural feathers. 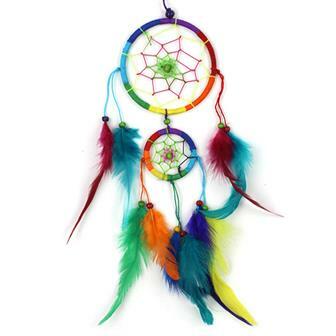 Small dreamcatcher made in bright rainbow colours using vibrant nylon and super bright feathers. 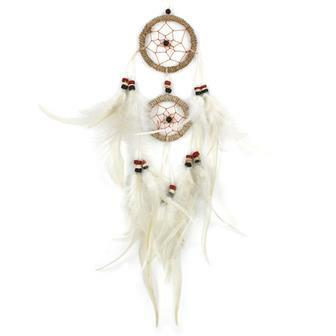 Dreamcatchers were used as a protective charm, especially for children, to protect against nightmares.